The coastal city of Al Khor lies about 35 miles (57km) north of Doha, within easy reach for travellers wanting a break from the big city. 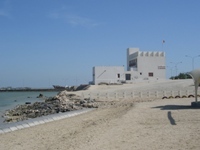 The Al Khor Museum is a double-story building facing the seafront that houses anthropological exhibitions, as well as an excavation section displaying the numerous archaeological discoveries made in the Al Khor vicinity. Visitors will see artefacts dating back from the Neolithic and Bronze Ages, as well as exhibitions dealing with more modern facets of Qatari culture, such as displays showcasing the area's pearling and dhow-building industries. One of the most interesting exhibitions depicts the myth of Ghilan and Mae, which refers to the region's first female pirate. A highly recommended tourist activity in Qatar, an excursion to the Al Khor Museum makes for a wonderful introduction to the country's rich cultural history. The city is also home to a number of interesting mosques and some lovely beaches.